What the best practice when beginning to Torch Fire my work? What the best practice when beginning to Torch Fire my work? 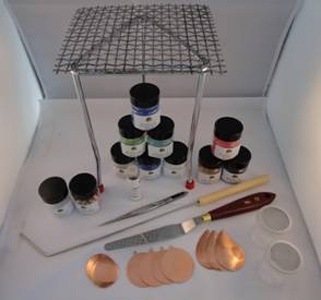 After launching our Enamelling Torch Firing Kit we received many questions from customers who had not Torch Fired before but wanted a bit of general advice to get them started. It’s important to always fire from beneath the blank, also move the Torch in a steady, even motion. The aim is to spread the heat evenly across the piece that you are firing, holding the torch approximately 3-6 inches away from the piece. How do I clean the backs of my copper blanks after firing to remove scale?